In family law disputes, it might be necessary to subpoena medical records of either the opposing party or a third party. Seeking to issue a subpoena can be a complicated process, and is regulated by court rules of the relevant courts. This ‘how to’ guide seeks to provide a step-by step guide to assist a self-represented litigant who want a court to issue a subpoena for medical records. This guide will deal mostly with the subpoena for production (1), though, it might be necessary to subpoena a medical expert to give evidence at a hearing. It is important to note that the Family Court of Australia will not issue a subpoena for a self-represented litigant unless a registrar has given prior approval.2 In such a case, it is necessary to prepare a letter to support the subpoena. Note: Make sure that the form that you are filling out has been approved by the court in which you are litigating. 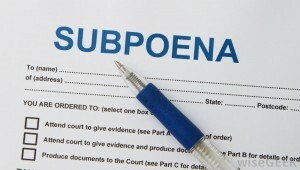 ■ – A subpoena must identify the person to whom it is directed by name or by description or office or position. If you wish to subpoena an organisation, the subpoena should be directed to a person authorised to act on behalf of the organisation. ■ – You cannot request the issue of a subpoena requiring the production of a document in the possession of the Court or any other Court. To seek a document in the possession of a Court you have to give written notice to the Court. Step 2: File the Subpoena Once you have completed the subpoena, file it at the Court. You will need to file the original and at least two copies. You will need to ensure that you have enough copies for service on each other party including the independent children’s lawyer if one has been appointed. The Court will keep the original subpoena and give you back the copies sealed with the Court’s stamp. 3.1 Mode of service There are differing requirements for service in different jurisdictions. – Family Court of Australia: The Court requires that a person who requested the subpoena to be issued must arrange for it to be personally handed to the named person. – Family Court of Western Australia: This court requires all subpoenas to be personally handed to the defendant. 3.3 Brochure When serving the subpoena on the person subpoenaed, and other parties or interested person, you should also provide them with a copy of a brochure which gives the named person information about their rights and obligations. These brochures can be obtained from the relevant Court registries or downloadable from court websites. 3.5 Conduct Money At the time of service of a subpoena, conduct money should be provided to the named person. If you do not provide this money, the named person is not required to comply with the subpoena. For a subpoena for production, you must give the named person conduct money sufficient to meet the reasonable expense of complying with the subpoena. This includes the cost of identifying the documents, copying and collating the documents required. Minimum conduct money for the production of documents will be at least $10 or other sum ordered by the court or agreed to by the parties. – The subpoena is issued more than 21 days before the court date. – A written notice that the person requesting the subpoena intends to rely on this provision at least 21 days before the court date. 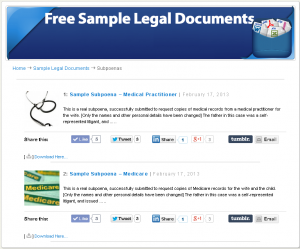 – You file an affidavit of such service at least seven days before the court date. – The named person produces the medical records more than seven days before the court date and does not object to any party inspecting the documents. – No other party to any party inspecting or copying the documents by ten days prior to the court date. The terms of the subpoena are too broad. Such a person may seek an order for a subpoena to be set aside. If they object to their records being inspected, they are allowed to file their notice of objection within 7 days after the date for production in the subpoena. In this case, you, or any other party or interested person, will not be permitted to inspect the medical records until the later of 7 days after the date for production, or the hearing and determination of any objection.